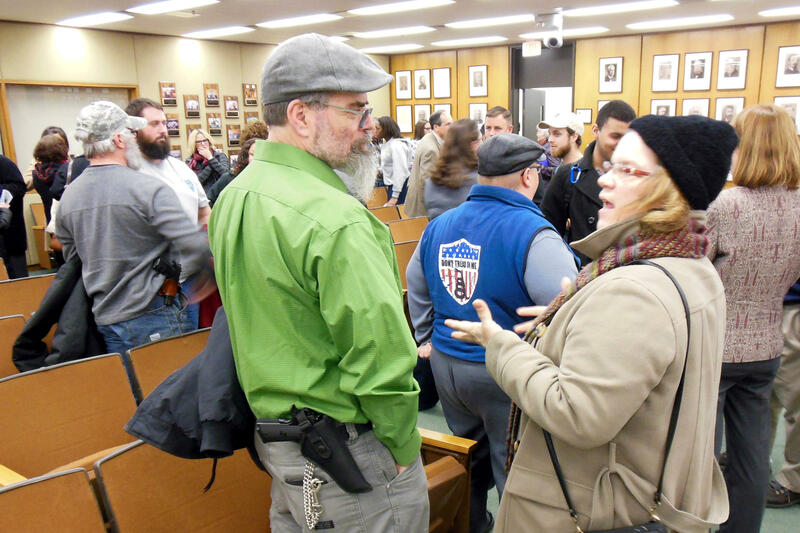 Open-carry advocates at Grand Rapids city hall in February 2014. Police who arrived on scene worried about his mental state when they observed Deffert loudly singing “Hakuna Matata.” They checked him out, and then let him go. He was not charged with a crime. Deffert sued, claiming police violated his civil rights. This week a federal judge disagreed, saying police acted reasonably given the information they had. Deffert's attorney says it's not clear if he'll appeal the ruling yet. The Deffert case had become part of a rallying cry for open-carry advocates in Grand Rapids. They repeatedly attended meetings at City Hall and urged the city to repeal a local law that prohibits carrying firearms in public places. The city’s attorney says the city doesn’t enforce that provision.